This magnificent bookcase, a masterpiece of rococo design and cabinet-making, emanated from the St Martin's Lane workshop of the greatest of British cabinet-makers, Thomas Chippendale. 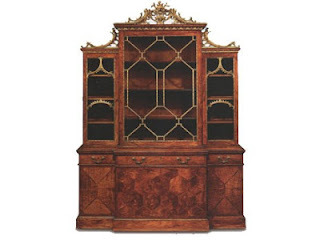 Crafted in the fashionable mid-18th century French or 'Modern' style adopted by Chippendale in his furniture patterns published in his Gentleman and Cabinet-Maker's Director (1754), this cabinet exemplifies Chippendale's mastery of furniture making at its best. This bookcase is actually multi-purpose. It is a china cabinet, dressing table, clothes press and chest of drawers all in one. Talk about efficiency! It is originally commissioned for the Lady Dumfries' Bedroom. Yes. They put this magnificent piece of furniture in the bedroom.... you must be wondering why? Well, in 18th century, it is actually the custom to receive guests in your bedroom. Hence you always put the best piece of furniture and art in your bedroom! In the summer of 2007, Christie's auction house was to auction off all the content of the Dumfries House (designed by famed Scottish neoclassical architect Robert Adam). This collection, in Ayrshire, Scotland, is particular important in English furniture pantheon because it contains the only fully documented works of art dating from Chippendale’s illustrious Director Period. Luckily the estate and its entire contents was purchased for £45m in the last minute by a consortium headed by Charles, Prince of Wales. The intention was to renovate the estate to become self-sufficient, both to preserve it and regenerate the local economy. The house is now open for tour and parts of the mansion can be rented out for weddings, conferences, banquets, etc.. I would definitely love to have dinner in one of the 18th century dining room anytime! Someday! Next time when you are in Scotland, don't forget to go visit this beautiful manor.